I have been on the hunt for a great pair of floral trousers for years. I just couldn’t find a pair that were the the right colouring, length or price. Thanks to a little boxing day shopping i found these beauties at River Island. 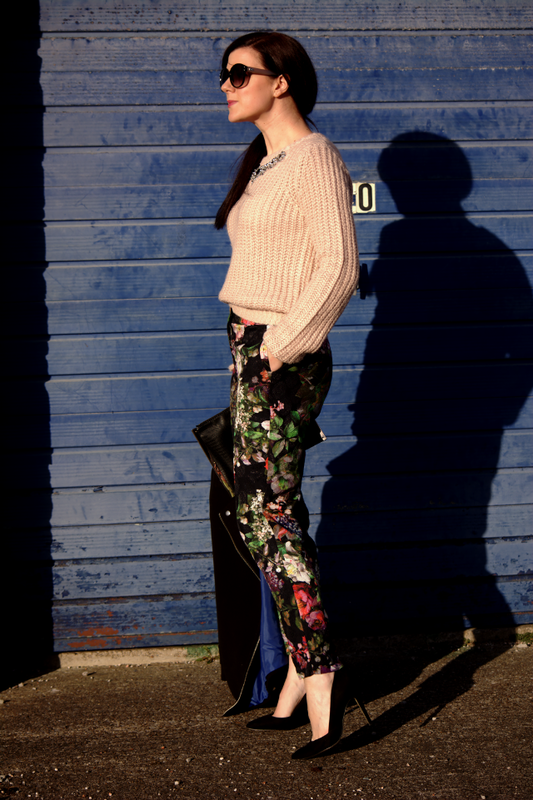 The perfect floral trouser. The colours are beautiful, the ankle skimming length, perfect, the price , on point at a mere £15! It was the holy grail of floral trousers. I’m so pleased to have added them to my wardrobe, they have multiple remixing possibilities, such as with stripes, a blouse or a plain tee, with a blazer or leather biker jacket. I am very happy to add them to the gang. 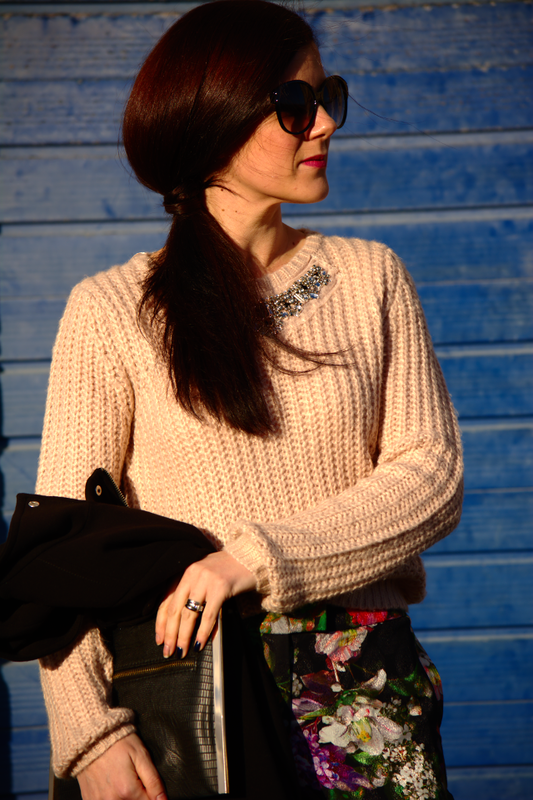 So with the first sign of a bit of spring-sunshin(still cold, not gunna lie), i pulled them out and popped them on with this blush knit sweater with already added bling. Thats another thing i love about them, they are the perfect year round trouser. Happy floral trousers make for a very happy Rachel! Do you own any floral trousers? I like how you combined it. I don't have any floral trousers but I should when looking at you. You look great! Thoes heels are amazing. You've just reminded me to hunt out my floral trousers rachel! These look gorgeous on you! Well, I am officially on the search for a flowered trouser. Great inspiration by you. Thanks for hosting. Love these! And the pictures Rachel! Oh you hit the golden hour perfect with this one. And the setting. Everything is perfect! Thanks for providing us with a link up. I'm really getting into it, and I've been getting more views, so that is good. Now maybe I can turn them into readers. I do have to help you out with a funny little typo you made. I think you meant popped, right? *blush* Hee hee. PS The hair is looking lovely! oh my god.. i actually did.. can you believe it?! Best typo award definitely goes to me! haahaa! Serves me right for speed typing late last night and possibly having poopy puppies on the brain LOL! Those pants are fabulous! I have a pair that are lighter in color, but I love the rich colors in yours. Beautiful! Totally STUNNING on you! Stop by FUN FASHION FRIDAY and share your gorgeous style with us! Those dark floral pants are absolutely stunning on you and for the price you paid they were such a STEAL!! Those floral pants are fantastic! This makes me long for spring… your new hair colour looks great, much softer. I'm with you sister… I've been looking for a great pair of floral pants too. Looks like you nailed it. LOVE THE COLORS ON YOU! 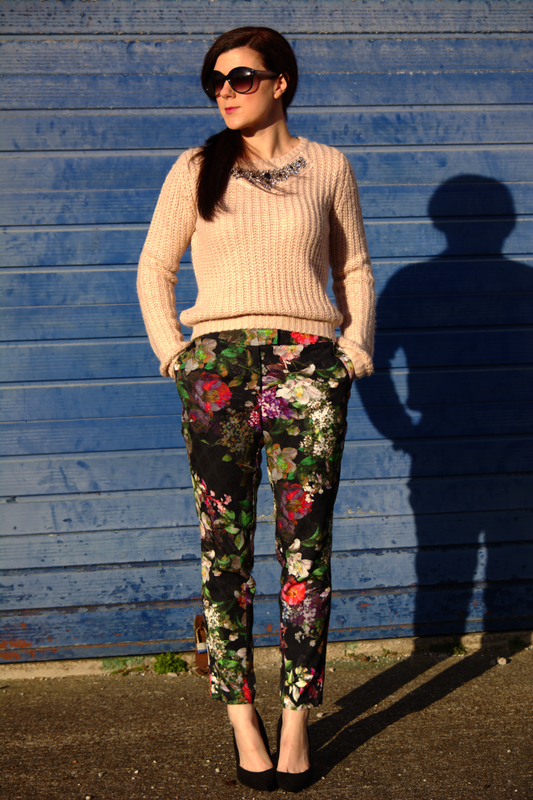 Count me in as in love with those moody floral pants! Love these floral pants! Love them paired with this jeweled sweater! Rachel I can't believe you got those floral beauties for 15 quid!! What a steal, they're perfect. This is how smart winter dressing should be done. The outfit is so you, and as always I'm in awe of your bling, sweetie (part of the sweater)? In answer to your question re. owning floral trousers? the answer is yes – lots. Lots and lots, oops!! Hope you're enjoying your new hair colour and your Friday! Thanks for hosting my gorgeousness. I love these pants and this whole outfit. I often see style ideas on blog and pin them for inspiration. I don't often love something so much I actually want to go out and buy it. These pants are on that short list of things I'm definitely going to look for! Thanks for sharing!! Great pairing florals with the stripe type lines in the sweater. Very chic. and Yes, I am back and so is my link hoppy thinggy thing. These pants are fabulous!! I love florals but so afraid to wear the print in pants. Rachael, I love the flat front, the style and the colors in those pants! Love that your paired it with this beautiful peach color! I don't have any floral pants but now I want a pair, these ones are beautiful!! Awesome pants!! They bring the perfect amount of color to the day! Rachel, Those pants are absolutely gorgeous and you're right, there are so many ways you can style them. Beautiful as always. i saw a picture of Miranda Kerr the other day of her wearing three quarter long, floral trousers not unsimilar to yours and she and her outfit looked so beautiful and now this blogpost has made me decide to get over the fear of not pulling this off and get myself a pair of floral trousers!! Rachel I love this outfit! I only own a pair of blue and white floral trousers so I only feel like I can wear them in the Summer. The black floral is perfect for this time of year and I am in love with the coat. Love how this whole outfit is styled. OhMyGosh! You managed to find my dream florals! Really, I have a page or two torn out of magazines with just this kind of print! Beautiful!!! I love these trousers, hey look ace on you! 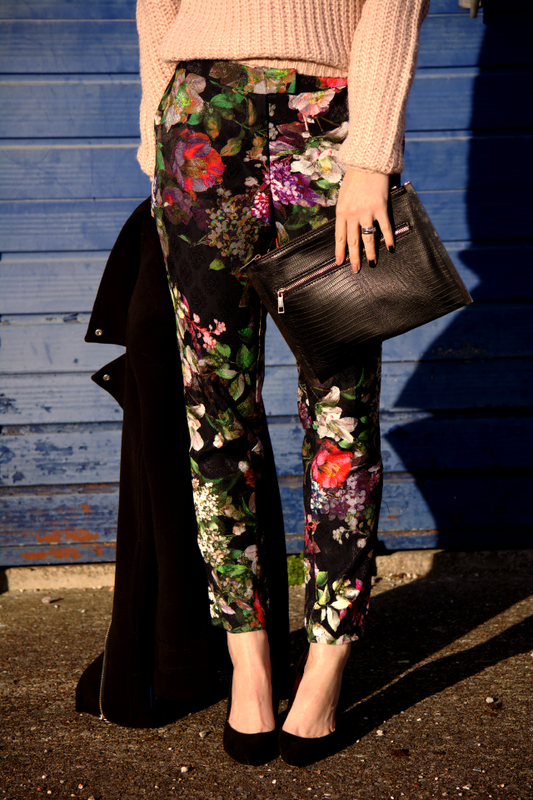 I absolutely love floral trousers! I have a couple pairs. Yours are so cute paired with the chunky knit sweater. Such a perfect early spring look. Those pants are absolutely amazing! I love Dutch inspired floral prints. Cool blog you have here! Keep up on this level and it will grow bigger. In the meanwhile, see some cool trendy juniors clothing to raise your mood! This is a true body enhancer. These trousers are so great!